"MILITARY CITY, USA" & A CATTLE DRIVE! 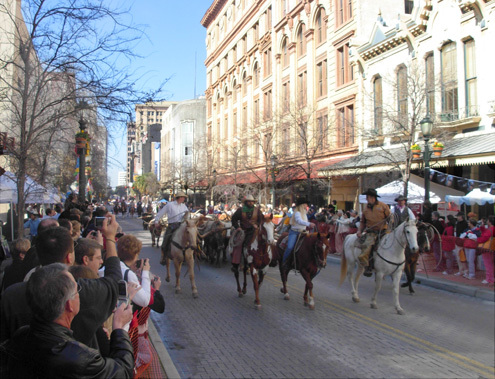 "As Texas' second largest city, San Antonio has the reputation of a fun, loving town. of the city's Hispanic heritage, which abounds with colorful tradition and vivid memories." I must say, we are thoroughly enjoying our first visit to San Antonio! I can't remember exactly why we decided to spend a week here, except we were looking for somewhere interesting between Phoenix and Houston while we killed time before Jim's Rocky Raccoon race. We wanted economical campground fees and reasonably warm weather. 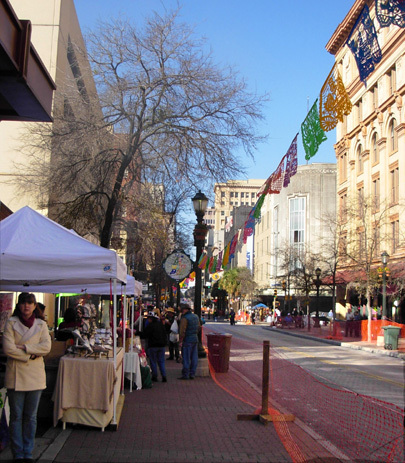 From what we could determine on the internet and in our travel literature, San Antonio looked like a nice place to visit in January, with its mild temperatures and minimal chance for snow. Our research and instincts paid off. It's been a good choice for us in all regards. 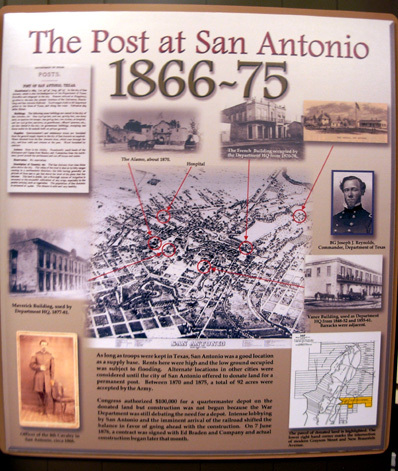 San Antonio has a long military history, which I'll talk about again in an entry about the famous Alamo. There is still a big military presence in the area, what with sprawling Fort Sam Houston and Lackland / Kelly Air Force Base located here, as well as the smaller Randolph AFB and Brooks City-Base. 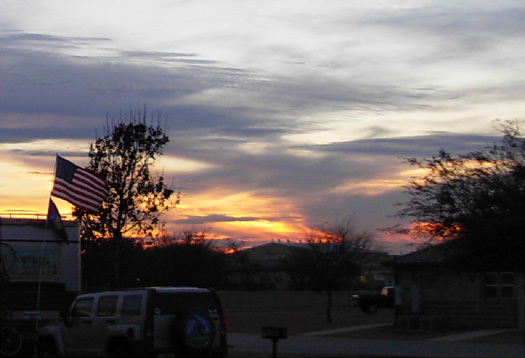 Camp Bullis Military Reservation is just north of town. You can see why San Antonio has been dubbed "Military City USA." 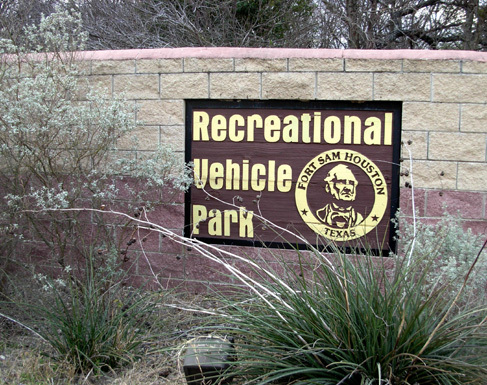 We are very pleased with our choice of the Recreational Vehicle Park at Fort Sam. Before we left on this trip Jim read our military campground directory and information on-line about the various posts and bases with camping facilities in the area. He was initially drawn to Fort Sam but we were put on a waiting list because the campground was full this week. We were happy to receive a phone call a couple weeks ago to let us know that someone had cancelled his reservation. Would we still like to stay for a week at the end of January? You betcha! So here we are, and we're very happy with the place. It was a hassle finding it several nights ago but now that we're here we see why it's so popular in the winter. The weekly cost ($96) is very reasonable for full hook-ups, the sites are spacious and grassy, there is a laundry room fifty feet from our door, we can run all over the base on roads and trails, and it's very convenient to downtown attractions. That means we're doing more in town here than we did in Phoenix. We can be downtown in less than ten minutes. The freeways and streets are easy to learn and traffic isn't nearly as bad as around metro Phoenix, even though this is a large city. If you're considering a visit to San Antonio, a decent one-stop source of information about the city's attractions, history, culture, climate, and other features is Wikipedia (an easy resource, although I can't vouch for its accuracy). There are some good photos on that page. For other sources of information, just use your favorite handy-dandy internet search engine. FORT SAM HOUSTON AKA "FORT SAM"
In addition to lots of activities in and around the city, we have also had plenty to do on this large post: working out at one of the fitness centers, visiting the history museum, shopping at the PX (post exchange) and commissary, going to the library, getting an inexpensive haircut (Jim) and perm (Sue), and running around the post. We've even found some dirt trails! There are other activities here like golf, swimming, and horseback riding for folks who enjoy those sports. Both the equestrian center and golf course are close to the campground. Many of our U.S. military installations are like miniature cities, with activities and services geared toward thousands of active military personnel and the civilian contract workers who support them. :"Fort Sam" is particularly big -- 3,300 acres in size, with approximately 27,000 military and civilian folks at work. It's one of the larger Army posts in the country. And like White Sands Missile Base, the building numbers aren't in sequence. It's a bit difficult to find particular buildings at first, even with a map, but we were doing OK after a couple of days. We settled into our new "home" quickly. It's nice to be in one spot for eight nights, with everything so convenient. On the first day here Jim was able to determine what was causing the problem with the slide-out (a sheared bolt) and fixed it. We found the closest stores we wanted to use off-post (REI, Costco, Sam's Club, Lowe's, Wal-Mart, Flying J). We ran and drove around the post, getting acquainted with the location of trails and streets with little traffic, off-hours at the golf course (nice place to run! 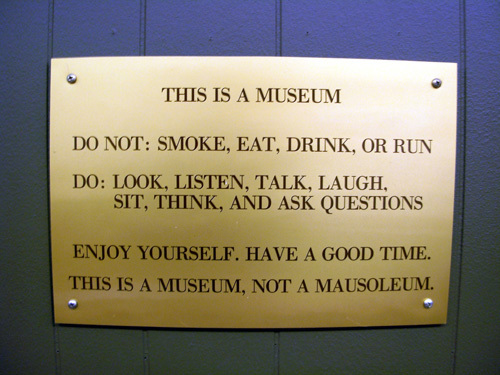 ), and services we can use here. And we got acquainted with the campground office staff and some of our neighbors, who are friendly and considerate. Everyone has some connection to the military, a good place to start conversations. We feel right at home here. 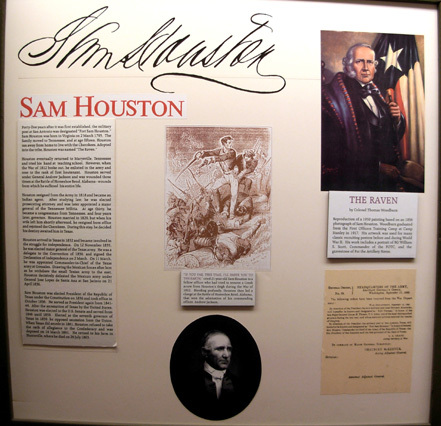 The post was originally founded in 1845 and later named for the first president of the Republic of Texas, whose photo is above. It remains a major, active military installation vital to the defense of our country. It is command headquarters for the Fifth U.S. Army (now called the U.S. Army North), the U.S. Army South, and several other divisions of the Army. It is reportedly the birthplace of military aviation. Fort Sam has also become the largest and one of the most important military medical training facilities in the world.. 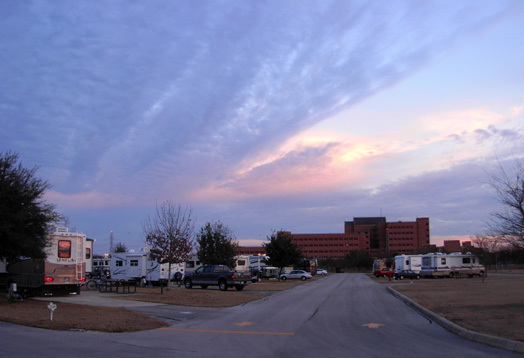 It is home to the Army Medical Department (AMED), Brooke Army Medical Center, and other medical commands, academies, research centers, and hospitals. 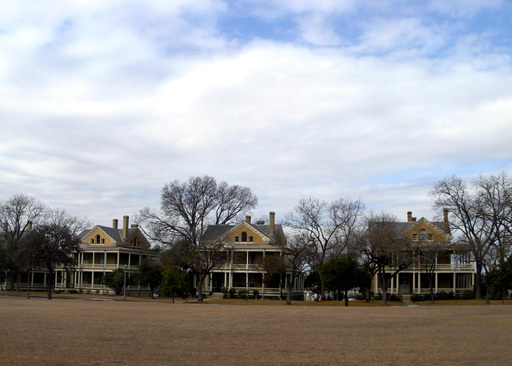 There are so many (900+) preserved historic structures on post that Fort Sam has been named a National Historic Landmark. Although we missed touring the oldest building on post, the Quadrangle, we enjoyed the architecture of many of the historic buildings we ran and drove by. Originally a supply depot, the Quadrangle now houses the U.S. Army North command. The building is perhaps most (in)famous for housing Geronimo and his fellow Apache prisoners of war for about six weeks in 1886 until the government decided what to do with them. 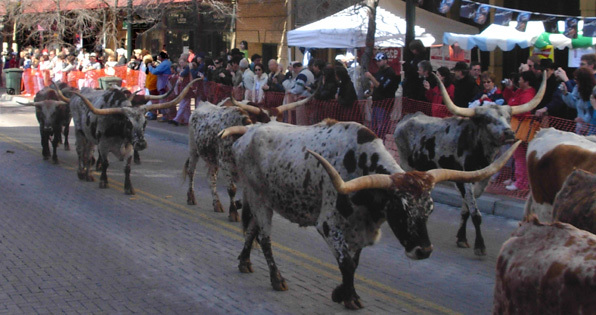 Jim and I have been all over this country and we've seen and done some unusual things, but this was a first for us -- observing yesterday's miniature long-horn cattle drive down Houston Street to the Alamo! We heard about it on the news as soon as we got here and I knew it was just one of those unique experiences I had to have. This is Texas, after all, and I've got a little bit of cowgirl in me. Jim was game, so we found ourselves walking along Houston Street on Saturday morning, trying to find a good spot to watch the cattle and take photos. 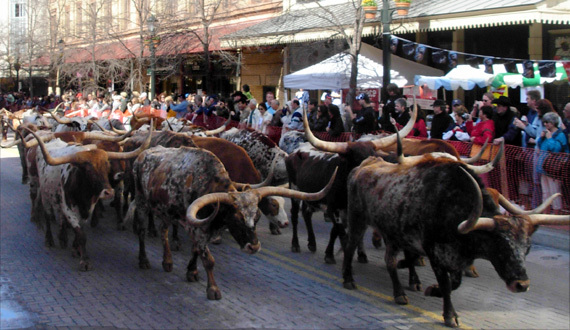 There were lots of spectators milling around who were enjoying the arts, crafts, and food booths (organized by the Houston Street Fair & Market) as they waited patiently for the longhorns to appear. Musicians entertained the crowd and various civic organizations tempted folks with their grilled and BBQ'd edibles. 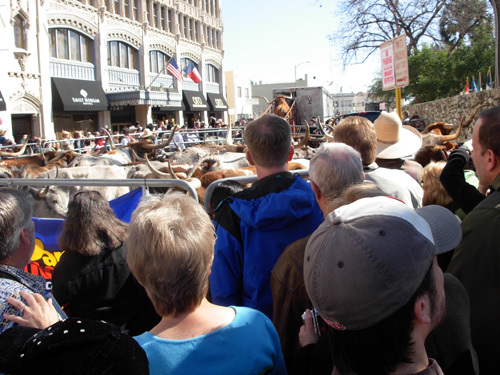 One cowboy mingled with the crowd at our end of the parade route by riding on a longhorn steer through the streets, and another steer was contained near the Alamo for the spectators to see up-close and personal. My, those are loooong and very sharp horns!! 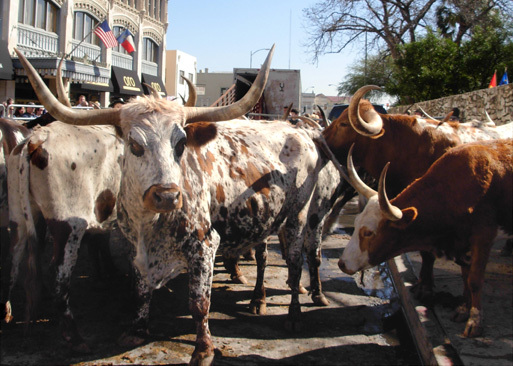 Although cattle are no longer driven through the city streets to the stockyards like they commonly were in the 19th century, the legacy of the cattle drive looms large in San Antonio's history. 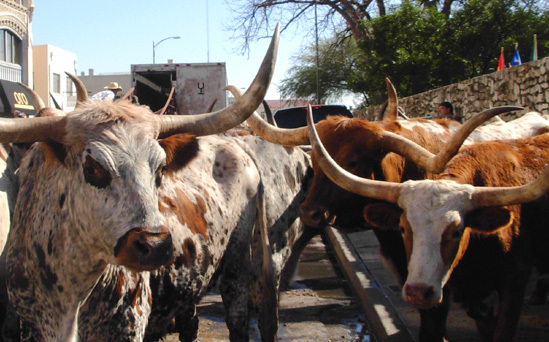 Cattle were king in Texas after the Civil War. While there was a glut of cattle in both Mexico and Texas in the late 1860s, the northern states were suffering a beef shortage. An industry was born. Local ranchers blazed the historic Chisholm Trail from San Antonio to Abilene, Kansas so cowboys could drive the cattle northward, where they fetched a fair sum of money. The famous cattle drives ended by 1890 thanks to rail lines and barbed wire, but the legends remain in American culture. Who hasn't seen cattle drives memorialized (and romanticized) in western movies and books?? Cattle are still important to the economy of Texas, of course. But for the last 130 years they've been trucked or sent by rail to other parts of the country, not driven over land by cowboys. Thousands of acres of former ranch land around San Antonio now sport subdivisions instead of cattle, yet the city still celebrates this part of its multicultural heritage. I sure wouldn't consider it a "cow town," though. Despite all the historic buildings and festivals that honor old traditions, San Antonio is thoroughly modern. The mini cattle drive is not an annual event; we were lucky to be here when it happened this time. It was scheduled to publicize the large San Antonio Stock Show & Rodeo that begins on Thursday -- and it did garner the attention of thousands of residents and visitors. Here they come! Get your cameras out! 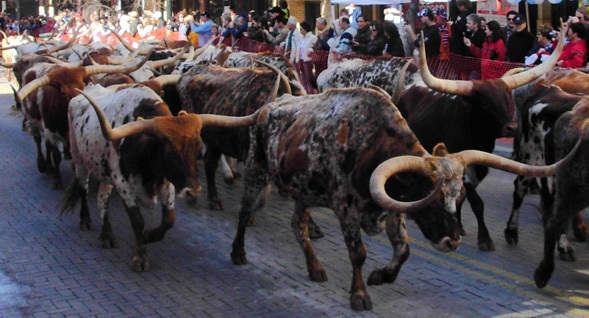 Thirty-five longhorns were trucked to town from the Y.O. Ranch in Kerrville. I'm not sure if they were all steers (castrated males raised for beef) or if there were bulls (breeding males) and cows (females) mixed in. Both sexes have long horns and I didn't even think to look at other, um, "parts.". We stationed ourselves near the Alamo at the end of the ten-block route. That way we got to see the cattle walk by AND see them herded back into the trucks. When we could see them coming I climbed up about 18 inches above the sidewalk onto the base of a streetlamp, wrapped one arm around the post so I didn't fall off, and took photos with the other hand. With folks standing three abreast or deeper and hanging 'way out over the plastic fencing, it was the only way I could get some clear shots. The Big Boys positioned themselves in the lead. That's a lotta beef. I must admit I was expecting something a little more, uh, fast-moving, like the "running of the bulls" in Pamplona, Spain. This was no stampede, however. The cattle moved along at a leisurely pace behind several quarter horses and their riders, following dutifully with the largest fellas toward the front and the smaller ones at the back (they have their testosterone-fueled "pecking order," after all). Good thing longhorns are well-behaved. Look at those sharp horns! 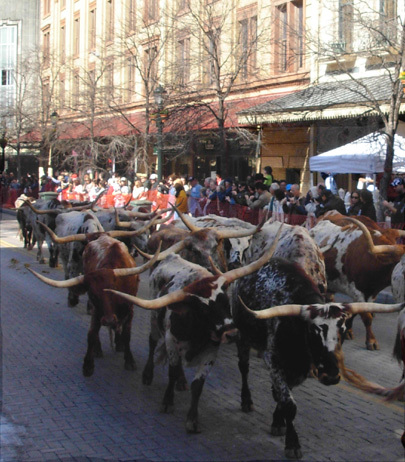 Once the cattle got to our part of the route near the Alamo, the parade wound down. Quite a few of us followed behind the longhorns as they were herded first into a large fenced-in area, then into several trucks for the ride back home. I gradually wormed my way to the front so I could take some close-ups of these gentle, intelligent animals. Aren't those faces sweet? The horns look lethal, though. Spectators who had lost their interest in the cattle visited the festival booths or swarmed into the area inside the wall (on the right in the photos above) to visit the Alamo. We decided to wait for a weekday morning for our Alamo visit when it wouldn't be so crowded. Even though we'll be leaving San Antonio the day the rodeo starts, we got to see what I consider to be even more fun (and free, to boot). I've been to a rodeo before, but not a cattle drive! 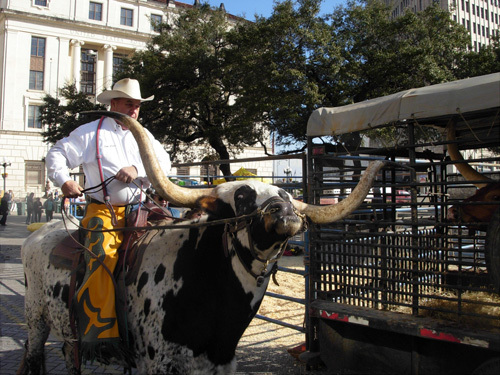 Check out this web site for more information on the origin, history, and myths about longhorns: http://www.texancultures.com/hiddenhistory/Pages1/shackelford.htm Or there's Wikipedia for the "Cliff Notes" version..
Next entry: San Antonio's intriguing River Walk. Wish Roanoke would do this with its river!